Below we have put together a few pointers and tips to ensure you keep your nails in tip top condition. Tip 1 - Keep your nails fresh and clean. It's very easy for dirt to get underneath your finger nails, especially if you have been out and about, so cleaning them is a must. Make sure you give your nails a good scrub with soap and water. If you find you have dirt under your nails that you can't get out, use the tip of a small nail file and gently brush it under your nail to remove the remaining dirt. 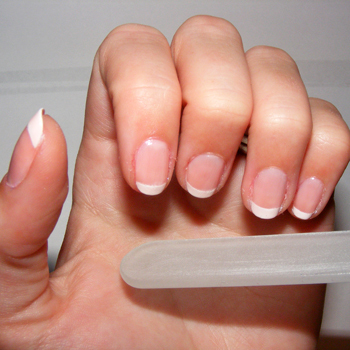 Tip 2 - Now your nails are clean, keep them in shape by filing them. File your nails carefully, a little bit at a time, ensuring the tip of the nail doesn't get shorter than 1/4". If the tip is shorter than this, it can weaken the nail and it might lead to a break. When filing the nail, go from the corner to the center in one direction. You can grow your nails to the length you desire and file them to either a rounded edge or square edge, the choice is yours! Tip 3 - To give your nails that extra bit of glamour, you can buff them to give them a shinier finish. Start at the cuticle and work your way down to the tip with medium pressure. Don't use a back and forth movement as heat builds up and this can damage your nails. Continue lightly until all ridges on the nail surface have disappeared. Tip 4 - Moisturising nails keeps them looking fresh. Get some cuticle cream, put a drop on each nail and massage the cream into the edges of each nail. This will moisturise the skin around the nail and the nail itself. Aside from moisturising your nails, its important to look after your hands too. Purchase some hand moisturiser from your local shop and work it into your hands on a daily basis, we recommend doing it of an evening once your hands can rest for the day or even applying just before you go to bed. Oh and try not to bite your nails!